Over the years, we have said this many, many times and we make no apologies for saying it yet again – the jailbreaking scene is often the best place to go if you want to see the things that Apple should be looking to borrow for upcoming iOS releases. We come across tweaks that fall into that category weekly, and one that falls very much into that category is Vigor. At its core, what Vigor does is take an app’s icon and replace it with information either from within the app or its notifications, depending on which app we are talking about. On the face of it, that does not sound all that interesting, but in practice, it not only looks absolutely awesome, but it also has the potential to offer super-quick access to information without having to launch an app in order to see it. Activating Vigor is as simple as opening Control Center and tapping the Vigor icon beside the Brightness slider. 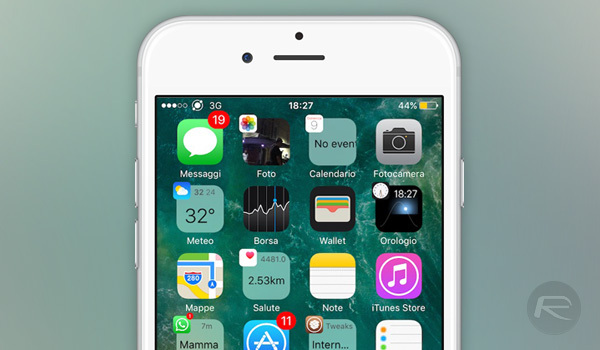 This button enables and disables the tweak, with another Control Center page housing a place for configuring how individual apps behave when Vigor is invoked. The latter is super-simple too, with users simply double tapping the Home screen. This causes all compatible apps to have their icon shrink into the top-left of where that icon used to be, with the rest of the space now taken up by either text from an incoming notification or something much more interesting to look at, such as the weather or the album art for the track that is currently playing. The best way to get an idea for what Vigor can do is to either install it or watch the demonstration GIF embedded above. A couple of loops of that and we think you will be rightly hooked. If that does do the trick, then Vigor can be downloaded from the Cydia jailbreak store, via the BigBoss repository for $1.99. The tweak is compatible to work with iOS 10.